NASA has been touting its Space Launch System (SLS) as the “most powerful rocket ever built” since its inception, and initially listed its payload capability to low-Earth orbit (LEO) as 154,324 pounds (70 metric tons). Though less than what the Saturn V could launch when it was active, it was a significant increase over the Space Transportation System’s – better known as the Space Shuttle – 60,600 pounds (27.5 metric tons) offered. Indeed, when SLS began its development, United Launch Alliance’s (ULA) Delta IV Heavy was the most capable launcher in the U.S. fleet, with a 63,470 pound (28.79 metric ton) capability to LEO. Therefore, with an ability to loft more than twice the payload of its closest stablemate, SLS would clearly meet the agency’s need for a vehicle capable of supporting deep-space human exploration. However, with the rapid growth of NewSpace companies like SpaceX and Blue Origin, many pundits began to wonder if there was a need for a rocket like SLS. In fact, when SpaceX launched its Falcon Heavy – with a LEO capability listed as 140,700 pounds (63.8 metric tons) in its fully disposable configuration – those voices became even louder. NASA continued to position its super-heavy-lift rocket as a deep-space vehicle suited to the agency’s goal of sending crews to the Moon and Mars. NASA even changed SLS’s stated capabilities from LEO to an exploration-focused Translunar Injection (TLI) rating. With the new metrics in effect. SLS in its Block 1 configuration was advertised of being able to deliver more than 57,320 pounds (26 metric tons) to TLI, replacing the original LEO numbers on the agency’s infographics. Since SLS is designed to deliver crew and cargo to destinations beyond LEO, this shift made sense. Nevertheless, SLS was thought to fly only once in its initial Block 1 configuration. 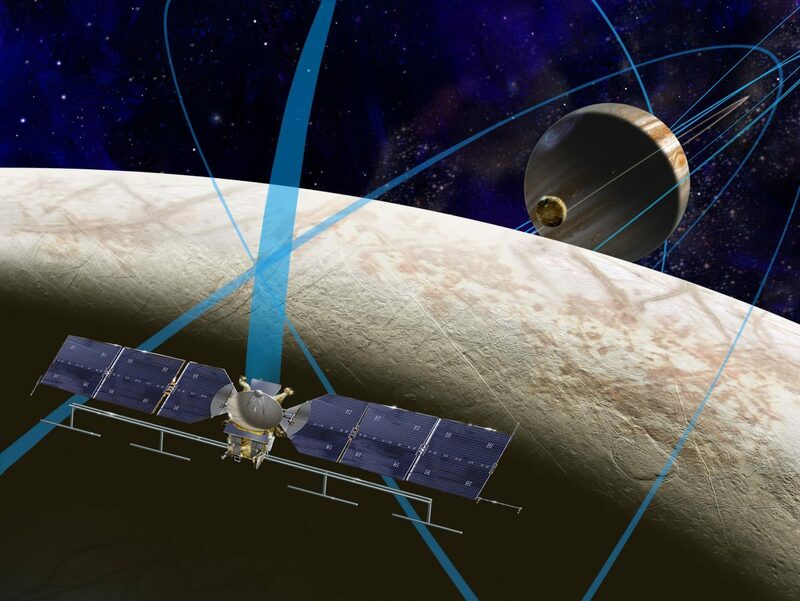 Later missions, including crewed flights to the Moon and the launch of the Europa Clipper to the Jovian system, could use the upgraded Block 1B model. This upgrade could boost the vehicle’s capabilities by more than 17,637 pounds (8 metric tons) to TLI, and if everything goes as it is currently planned – would serve as the workhorse of the SLS fleet. However, when it became apparent that the Block 1 design might make more than a single flight — including the mission to Europa — some began to voice concern that the Block 1 design would not be capable of delivering the 13,277-pound (6 metric ton) spacecraft to its destination, negating the push to use SLS in the first place. Spaceflight Insider (SFI) reached out to public affairs personnel involved with the SLS program at NASA’s Marshall Space Flight Center (MSFC) to find out if these concerns were warranted. Could SLS, in its Block 1 design, still deliver the spacecraft directly to Europa without the need for time-consuming gravity assist maneuvers? It would appear, then, that SLS’s Block 1 would be capable of shortening the cruise duration by more than half when compared to missions like Galileo. That spacecraft, launched from the payload bay of Space Shuttle Atlantis and took nearly six years to reach Jupiter. While a comparison between NASA’s SLS Block 1 and SpaceX’s Falcon Heavy is often made, the gulf between the two has actually widened. As the Block 1 design has matured, the agency has refined the vehicle’s capabilities by a significant amount. Though NASA prefers to position SLS as a deep-space rocket, SFI sought a clarification of the vehicle’s capabilities to a more common destination for rockets: low-Earth-orbit (LEO). This represents nearly 50 percent more payload to LEO than the next-closest launch vehicle, SpaceX’s Falcon Heavy. While SLS might not be aiming for LEO as its destination, it further highlights the difference between the two vehicles. 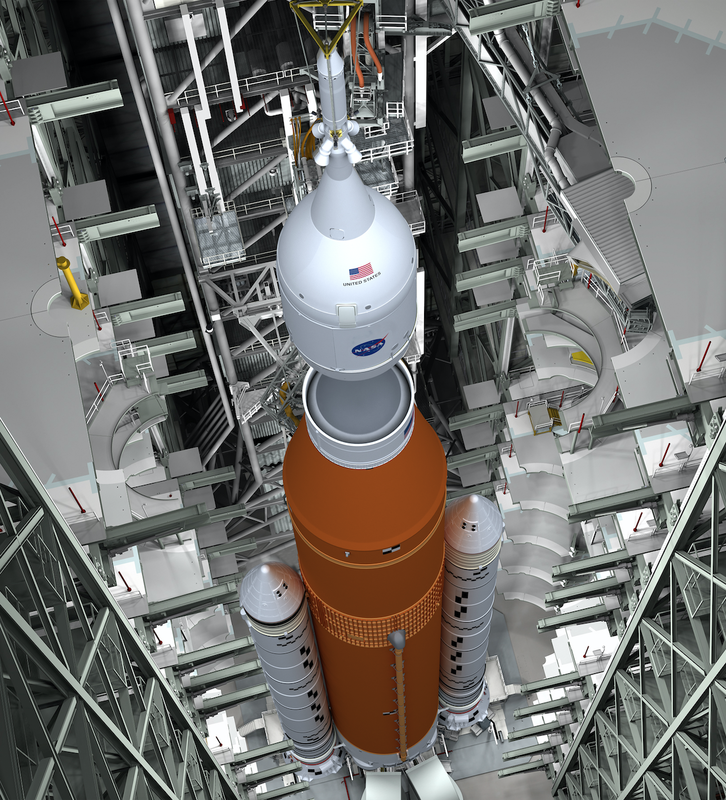 The agency continues to ready SLS for its debut flight, which is currently scheduled to take place in 2020, with the massive liquid hydrogen test stand at MSFC gearing up for element testing in December of this year (2018). Stennis Space Center in Mississippi, meanwhile, eyes 2019 for the core stage’s green run test. 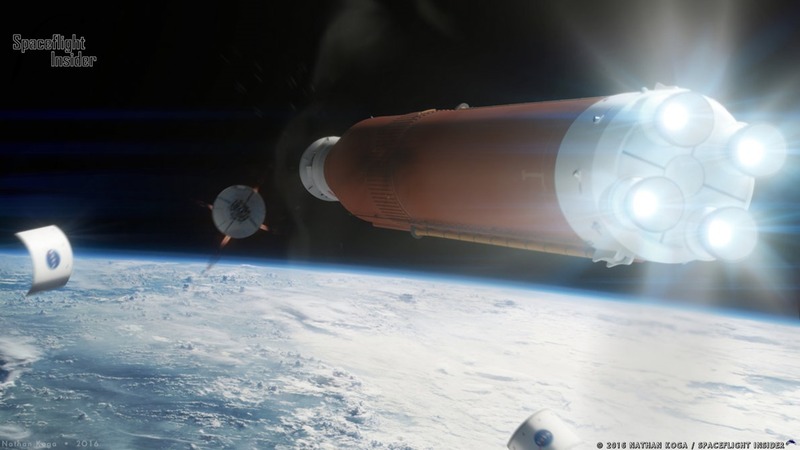 Regardless of when SLS evolves to its Block 1B and Block 2 configurations, it would appear that the progenitor of NASA’s next series of deep space rockets should be more than capable of the roles laid out for it to complete. How much you wanna bet that the Spacex BFR beats the SLS to launch? How much wanna bet that the SpaceX fans cry bitter tears when it exceeds all expectations? I wonder how many BFRs or New Glenns you could get for the cost of a single SLS. Every time I see the SLS I think, another year and another 2 billion (or is it 3 billion with Orion?) that could have helped humanity acquire advanced circular systems which could solve sustainability issues here on Earth as well as in space. I understand that the BFR is not yet constructed and that many jobs are on the line but either way this will mean a decade delay in solving these issues, it’s not like there’s unending time for these solutions to arrive with or without belief in climate change. Are we to expect Elon Musk and his companies to develop every single piece of essential 21st century technology before the rest hop on the bandwagon? Right now, that’s what it feels like. SLS. Might see one flight and then goodbye. It’s obsolete already. This is the worst kept secret of the SLS program. NASA grossly oversized the SLS core stage relative to the requirements of the NASA Authorization Act of 2010 Section 302. That’s why the project is 5 years behind schedule and $10 billion over budget. The worst part is that the extra performance to LEO is almost useless because iCPS is so small. Dragging that massive core stage higher so that iCPS can do TLI is grossly inefficient. EUS would be better but won’t be available until 2024 at the earliest. Block 1 performance to TLI, Mars, or Jupiter is only about 20% better than FH. But FH is available now, and is 90% cheaper. Gary, you know they’ll just hate it all the more if it succeeds. Nathan, depends what you mean by success. Will it fly, I expect that it will. Is it of much use in the 21st century, that is questionable at best. I can’t say I hate the SLS, it’s more like profound disappointment at this point. “Success” for the SLS is measured by the vast amounts of Taxpayer dollars it consumes and lobbyists it keeps employed. Launch on need fast backup crew rescue capabilities in LEO and across all of CisLunar Space is one of many important uses for the SLS and International Orion. The SLS will probably be an early user of highly efficient 900+ Isp nuclear thermal powered and super efficient large 4000+ Isp electric propulsion upper stages that can significantly improve the cargo and other payload hauling capability of the SLS to MEO, GEO, the Moon, asteroids, and Mars. If or when metallic hydrogen becomes available, the evolvable SLS will probably make full use of that future propellant that could offer 900 Isp to 1,700 Isp performance options and a massive increase for the SLS in putting payloads into LEO and TLI. The SLS enjoys broad national and international political support and is an open architectural design that is expected to evolve in different ways, including ways that could significantly increase its LEO payload performance while also diminishing its environmental impact. Full reusability reduces by about 50% a launcher’s LEO payload when compared to a similar but non-reusable launcher. Reusable launchers do about twice the direct damage to the Ozone Layer when compared to similar but non-reusable launchers. If Congress wants a reusable vertical landing SLS core, NASA might add a centrally located and relatively cheap, simple, and easy to start hydrolox expander bleed cycle 331,000 lb thrust LE-9 rocket engine to the base of the core of the SLS. Other options for SLS reusability should also be doable. The super high 5,000 Isp of efficient solar or nuclear VASIMR electric propulsion system powered upper stages and OTVs (Orbital Transfer Vehicles) could be used for efficient cargo hauling missions to greatly increase the MEO, GEO, and Low Lunar Orbit payload capabilities of the SLS, New Glenn, OmegA, Vulcan, Falcon Heavy, China’s Long March 9, Japan’s H3, Russia’s Soyuz-5 Super Heavy, Europe’s Ariane 6, and other launchers when compared to energy weak and much lower Isp chemical rocket powered upper stages and OTVs with Isps in the 350 to 465 range. Is any business or nation likely to plan on always using “60 metric tons of LOX-LH2 propellant” to transfer 34 metric tons of Moon Village or mining equipment cargo to a Low Lunar Orbit (LLO) when the other and much more efficient, cheaper, and environmentally lower impact option is to use only “about 8 tons of argon propellant” to do the same task? Posts about a launcher’s beyond LEO payloads and Lunar mission capabilities should include the context of the efficient payload increasing options for using Nuclear Thermal Rocket powered upper stages, OTVs, and Landers. Various nuclear power based propulsion systems are critical for efficiently building and quickly expanding human and robot colonies on the Moon and across our Solar System. What important and tangible benefits will justify and sustain the large business investments and national and international expenditures implied in regular SLS launches of the Orion and many other launchers and spacecraft that will be needed to send humans, robots, and cargo to contribute to building the international Moon Village and finding and mining Lunar resources? The clearest answer is found from gaining and maintaining new systems to help us effectively deal with two unfortunate realities that are far more critical than any human Mars missions. Many scientists and engineers have long understood that using Lunar resources and industrial capabilities to build large Space-based Solar Power systems (SBSP) in LEO, GEO, and high Earth orbit could help us to efficiently provide clean energy to everyone on the Home Planet. The SLS and many other launchers will be essential in this massive and long-term effort to use the Moon’s resources to help us decarbonize our Earth’s energy systems.